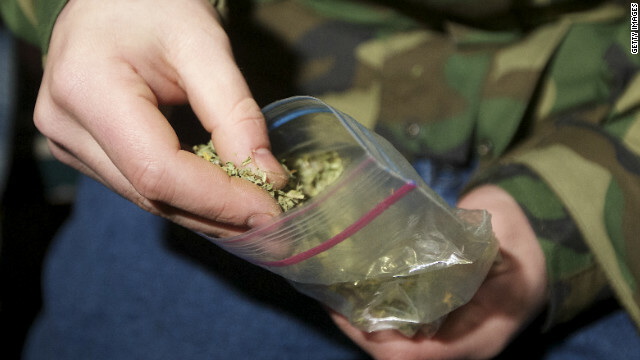 In a statement Monday, U.S. Attorney John Walsh said that the Department of Justice is "reviewing" the initiatives passed in both states and that the department's "responsibility to enforce the Controlled Substances Act remains unchanged." "Regardless of any changes in state law, including the change that will go into effect on December 10 in Colorado, growing, selling or possessing any amount of marijuana remains illegal under federal law," Walsh said. Marijuana is listed as a Schedule I drug by the Drug Enforcement Agency, meaning it's dangerous and has no medical use. Other Schedule I drugs include heroin, ecstasy, and psychedelic mushrooms. Medical marijuana advocates say it should be listed under Schedule II, comparing it to other prescription painkillers that have a high potential for abuse. Marijuana advocates say the attack collides with California's law and goes against a campaign promise by Obama to not circumvent the state's relaxed rules. A USA Today/Gallup poll conducted after November's election indicated 64% of Americans felt the federal government should not take steps to enforce federal anti-marijuana laws in states where it has been made legal for recreational use. CNNMoney's Jose Paliery contributed to this report. I don't see anyone arresting the hillbillys in Alabama that violate the federal consent law with thir state laws. How about you spend the money to go down there and find everyone married to a 16 year old and arrest them instead? Obama is still promoting smoking in the U.S. of unfiltered cigarettes. Great idea! That fits PERFECTLY with Obamacare! Namaste Everyone, The recent states approval of recreational marijuana subject to being overruled by the federal government in the future will have serious implications as history has taught us. Expect lower street drug prices, increased first time users and everyone experimenting with different types of drugs because the government has said its ok for one. Drugs provide lots of money, minimal investment which will encourage their manufacture. Conflicts will result between dealers and users which cannot go to the police for their criminal activity but must settle it themselves. We will need increased health care practicineers in pulmonary and behavior illnesses. Thank You, Namaste Timothy Murphy. The RX drug companies will do anything including paying off politicians. Thye do not want to give up there "piece of the pie". Your not suppose to notice things like that CJ, Obama's policy of "do what I say,not do as I do " policy. Let's see, a prohibition law that is ineffective, hypocritical and antiquated and an immigration law passed by AZ legislature that included language and practices unseen since Nazi Germany. God forbid we have a president that exercises rational thought. There's bigger fish to fry than discrepancies between federal and state laws.. as if problems in other countries supersede the growing problems in our own country.. sounds to me like Obama has a cloudy brain himself. Didn't the US just promise to send troops and patriot missiles to turkey? The GOP has said they want small federal gov and the states to have more power. Except when it comes to things they don't like, drugs, gay people, women who might die if they don't have an abortion etc. Of course most of the GOP smoke pot, a lot hang out in mens washrooms and it is okay for their daughter to have an abortion. The GOP need to go away. Legal, illegal... I'll still grow it and smoke it. No one will tell me that I cannot. I'd bet if the whole Congress sat down and passed the bong for an hour, they'd balance the budget by lunch time. Pot smokers can be most agreeable when food is awaiting them. Obama says, "This Bud's For You" to deal with for now. It's Friday people. Loosen up. War on "Drugs" Billions of $ lost. Prison terms, food, clothing and health care, Billions of $ lost. Associated Crime, Lost lives, lost opportunities in life, Billions of $ lost. Profit from legal growing, processing, distribution, Billions upon billions GAINED. HUGE Tax levies on sale. Billions of $ GAINED. Net turnaround from losses eliminated and profit and Taxes Gained....TRILLIONS of $. – Invest in 10,000 new Private Prisons so Good Ole Boys can make heaps of money off of incarcerating our youth and ruining their future employment chances because of a pot-possession charge. – Specifically target those most likely to indulge, which apparently means incarcerating all the Black community since they make up most of the current prisioners. – Pass a host of new laws which invade the privacy of US citizens so that we can make sure no one is enjoying themselves. – Give more tax breaks to Big Pharmacy so they can invent new drugs which sicken those who smoke. – Start spraying Paraquat over all of Colorado and Washington just in case. – Install drug testing equipment in all public urinals and post police to arrest anyone who tests positive. No expense is too much! A policeman on every corner! Sacrifice all to maintain the Purity of Thought that the Prohibitionists demand! /End Sarcasm. Really, just Legalize and Tax already. if u look at the transcript on 20/20 Obama says" we need to find other ways to deal with users",sure sounds like some kinda of harsher sentence to me. Marijuana is just like alcohol during prohibition. It doesn't hurt anything and criminals try to make a profit off it along with all the killing and robbing that goes with that status. Legalize it, tax it, put drug dealers and suppliers out of business and clear the jails of people arrested for marijuana related crimes which leaves room for real criminals. Sense the law has made marijuana federally illegal we have to prove it does not show an high class offense to the general population in health concerns and safety conditions. This particular plant is grown from original soil and is maintained with water, while sunlight is used to promote growth or essential production. Once the plant is ready to be harvested it can be used for a number of professional market regulated business interventions especially in the United Nations forum as we have the strongest department in the medical health field. And while you're in Deliverance country seize the moonshine! Hate to be a bearer of bad tidings, but this Will Be a Political Issue, in 2016, period. If something like this ends up bringing IN Trillions of Dollars of Taxes in a few short yrs, then it will end up political . I really don't blame Obama, and his administration, for not wanting to fool around with this issue. Why ? because : 1) He has much bigger fish to fry. 2 ) Since "some" states have already legalized it, it's going to much more difficult to "enforce it" on a federal level. It's like comparing this to other things. If something is Illegal in all 50 states, then the Feds can come in, and prosecute, if need be. For instance, if Liquor was only allowed in only a few states, people will be running to those states to buy as much of it, as they can, and it's taxed. But since Liquor is Allowed in All 50 States, then it's taxed in all 50 states. So, since the Feds are going to start "turning their heads the other way" when they see this, ( so to speak) it will probably still be outlawed for a while, but the "enforcement" won't be high on the "important list" – compared to other crimes, ie: murder robberies / & etc . There is no way the federal government will ever have enough money to effectively prosecute marijuana users. They have always depended on state police enforcing those laws and if the state doesnt support it its not happening, no matter who is president. Pharmaceutical companies are the second largest lobbiests AGAINST the legalization of pot. I think we all know why that is. Pot would take the place of many of the drugs on the market today with far less side effects. It's time to stop giving the money to the big pharmaceutical companies and the black market drug dealers. Give it to the agricultural farming industry and let the states receive the tax money for it. Allow it to create the jobs that it would create. There happens to be this little thing called the fiscal cliff and I believe that might be more important then worrying about who is lighting up and whether or not the feds should go after them. As for the issue its self, well there is a Mexiacan Billionaire, who prays the government doesn't change a thing. As for the rest the estimated value of pot transactions in the states is billions of dollars, heck it might even help the fiscal cliff issues. It's very easy to point out the insanity in drug laws when they equate marijuana and mushrooms with heroin. It makes these so called "experts" look like ignorant fools. It's like equating Near Beer with Everclear. Very simple, the Feds do not want to give up the power to enforce a ridiculous law. Any one with common sense would say let the states figure out what they want to do. Then the states who reap the benefit of common sense will convince the others that pot laws are antiquated, expensive and based on ignorance. The only people who benefit from pot being illegal are the criminals and the grand-standing politicians, spending YOUR money to make themselves look good.